Tropical Storm Kirk is quickly approaching the Lesser Antilles and will bring a threat of flooding rain, mudslides and tropical storm-force winds to parts of the northern Windward and the southern Leeward Islands beginning Thursday. The National Hurricane Center said convection had become better organized, prompting it to reissue advisories on Tropical Storm Kirk Wednesday morning. Kirk had lost its center of circulation Monday in the eastern Atlantic Ocean after first developing Saturday morning south of the Cabo Verde Islands. Kirk is about 60 miles east-northeast of Barbados and moving rather quickly west-northwestward. Tropical storm warnings have been posted for Barbados, St. Lucia, Dominica, Martinique and Guadeloupe, meaning tropical-storm-force winds (39-plus mph) are expected in these areas within 36 hours. Tropical storm watches are in effect for St. Vincent and the Grenadines, meaning tropical-storm-force winds are possible within 36 hours. 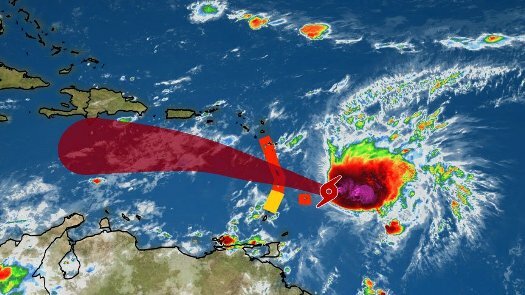 Steered by high pressure to the north, Kirk will arrive in the Windward Islands on Thursday, first in Barbados, then in the rest of the Windward Islands covered by warnings. Little change in strength is anticipated before striking the Lesser Antilles. The most serious threat from Kirk, however, will be from rainfall. Rainfall totals from 4 to 6 inches are expected through Friday across the northern Windward and the southern Leeward Islands. Isolated totals up to 10 inches are possible across Martinique and Dominica. This heavy rainfall over these mountainous islands will likely trigger life-threatening flash flooding and mudslides. Eastern Puerto Rico can expect 2 to 4 inches of rainfall, with isolated totals of up to 6 inches, as whatever is left of Kirk slides by to the south Friday and Saturday. Fortunately, Kirk is expected to encounter a formidable wall of wind shear – the change in wind speed and/or direction with height – in the Caribbean Sea this weekend. This should eventually rip Kirk apart before it can threaten other areas of the Caribbean, as it did to Tropical Depression Eleven last weekend east of the Lesser Antilles. Just over three years ago, Tropical Storm Erika dumped up to a foot of rain in just 12 hours on Dominica, producing catastrophic flooding and mudslides, killing 30, damaging or destroying 271 homes and damaging roads, bridges and other infrastructure on the island, according to the National Hurricane Center’s final report. Dominica Prime Minister Roosevelt Skerrit said Erika’s damage set the nation’s developmental progress back 20 years. The destruction Erika left behind was sufficient to prompt a committee of the World Meteorological Organization to retire the name Erika from use for future Atlantic tropical storms and hurricanes. Erika was only the second name retired for an Atlantic tropical cyclone which never reached hurricane status since names were first retired in 1954. Allison in 2001 – a multi-billion-dollar flood event in metro Houston – was the only other tropical storm whose name was retired. Like Kirk, Erika fought wind shear through its life cycle, but rainfall potential of any tropical cyclone is not a function of the intensity of the storm. The rainfall flood threat from Kirk should be taken seriously.